I’ve been so busy lately with writing and teaching that I haven’t been cooking much. We’ve been living on quick meals and take-out, which in Eugene is a sickening prospect after a day or two. My biggest foray into new dishes was a delicious Peruvian ceviche the other day, but the photos make it look like a jumbled mess, so I won’t bother posting. The acidic zing of vinegary dressings has captured my attention again, obviously. Great for mid-winter blues and the heavy, thick food we eat when the weather’s cold. One quick pickle I’ve been snacking on — lemon and yuzu citrus lotus root. 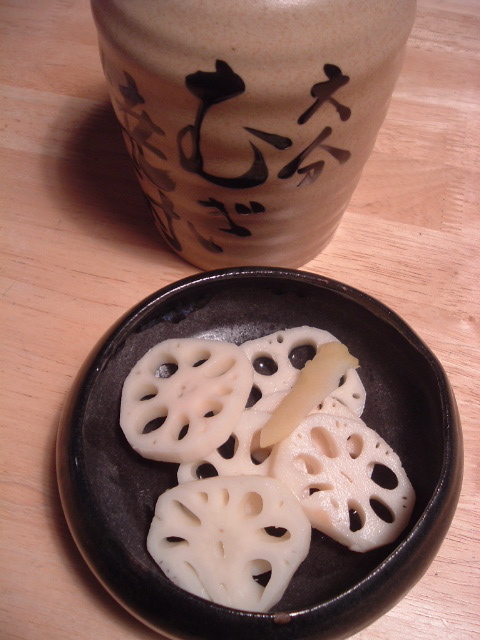 The lotus root is a rare creature in the vegetable kingdom. If you have access to fresh lotus roots, the buff-colored segmented plain jane that reveals its gorgeous creamy white flower pattern when you cut it, they’re beautiful to add to stir-fries. They do need to be kept in acidulated water after you peel off the buff skin, though, and blanched until slightly softened before stir-frying or making pickles. Or you can cheat like me, since I don’t have any other options here in Eugene, and buy a fresh, refrigerated package of already sliced and acidulated lotus roots at an Asian market. Don’t buy the canned ones. Trust me. Drain the water in the package, then add the lotus root slices to a wide, flat, glass or plastic container with a secure lid. Mix together a solution of 2/3 rice vinegar and 1/3 water, add a few long strips of lemon zest (or yuzu zest if you have it, yuzu being a Japanese citron with a lovely scent), a small scoop of salt, an even smaller scoop of sugar to balance the flavors. Pour over slices, and let it sit in the refrigerator for a few days. Eat as needed, preferably within a month. Breathe deeply as if you’re on a mountaintop temple, zen up your apartment with bamboo shades and an Amida Butsu candle, and throw around Buddhist lingo like a nirvana-attaining badass. sounds delicious. I’ve never met a pickle I didn’t like. oh, nomnomnom. all hail the queen of pickles.